House and time at Malvern: No 7, 1913 - 1916. Died: 26 December 1917 aged 19 in Belgium. Killed in action. 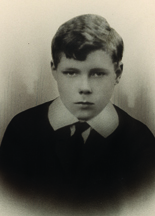 Son of E. C. Irish, 26 Daleham Gardens, Hampstead, N.W. and of Alice Christina Irish of 8A, Winchester Rd., Swiss Cottage, London b. 1898. Army III—I. House Prefect. House XI Football. Gymnasium Colours. R.M.C. Sandhurst; 2nd Bn. East Lancashire Regt. 1917. 'Irish had always intended to make the Army his profession, but, like so many others, left School earlier than was intended and went to Sandhurst, whence he entered the East Lancs. Regiment. He was a boy of robust character, and showed signs of developing into a fine man. His early death will be mourned by all who knew him at School, where his happy disposition made him a general favourite. His keenness for the Army at an early age was extraordinary, and it is sad to think that his career has been cut short so soon in a profession in which he had hoped to make his mark.' (Malvernian, Mar 1918).